Guess what! It's Signed With an Owl's 2nd Blogiversary! (Well, honestly, it was a couple of days ago. Fill in an expletive or two after "Oh...!") Last year I missed it too as I was in London when the blog turned one. Can you believe how fast time flies?! Anyways, I want to say a really big thank you to all of you who have been reading and supporting me! "THANK YOU!!!!" All of your lovely comments and emails inspire me to keep on keepin' on! I'm still amazed at how many friends I've made from all over the world since I started this blog. You guys mean so much to me! Before I get to something a little more exciting, I thought I'd share with you how I made this simple little felt banner! I think it'd be great for a birthday, holiday or any other celebration. Alright, so I started by sketching out my letters on paper (nothing fancy and no stencils since I like a close to hand written look), cut them out, and then traced them with pencil onto my felt (two of each letter). 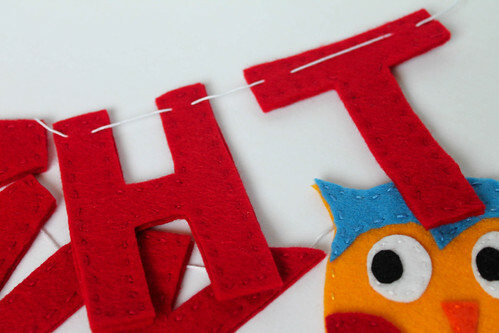 With the felt doubled and sewn together, the letters are much less flimsy (and way more adorable). I think they'd be cute with a contrasting thread color too! I sewed the letters (and the owl) together with just a basic running stitch with three strands of embroidery floss. 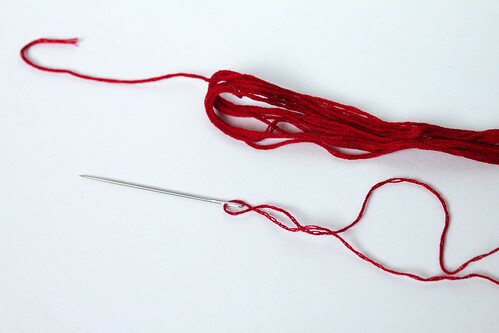 Normally I would have just used the full six strands, but I only had one little skein of the red I wanted to use. I figured I could make it last twice as long by using half the strands! I know, pretty clever (I just won't tell you how long it took me to come to that realization...). 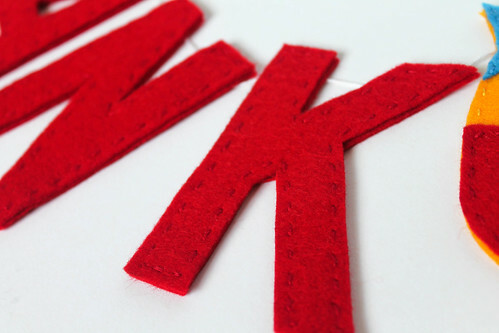 Once all the letters were sewn, I threaded them onto embroidery floss (all six strands) by sewing through just the back layer of felt. This made the letters easily adjustable. I could slide them around until I liked the spacing. And that's it! Easy peasy! Ok, on to the fun stuff! 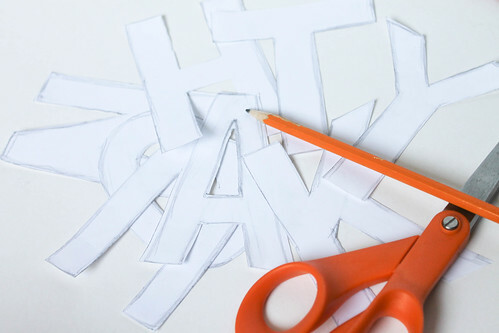 So, you may have noticed the interesting capitalization in this post's title... "BloGIVErsary!" You know what that implies?! A giveaway! Since I'm getting ready for my local craft fair in July, I was thinking about some of my favorite projects from this past year... What if I made some more little fox & trees and horses? And what if I made a few extras to give away to you lovely people? You can see this fox in THIS past post. This horse is from THIS post. So, if you're interested in winning either of these little guys, just leave a comment! But let's make things a little more interesting. You have to give a name suggestion for the Signed With an Owl's little owl mascot! On June 15th I'll pull three names randomly, and the winners can pick their prize! Sound good? Again, thank you all so much for sticking with me this long, and thanks to all my recently new readers too! I love you guys!! Hope you all have a fantastic weekend my friends! congratulations my dear, with all my heart!!!! I think your owl could be named Mr Goggles!!!! Happy Blogiversary, Kate! 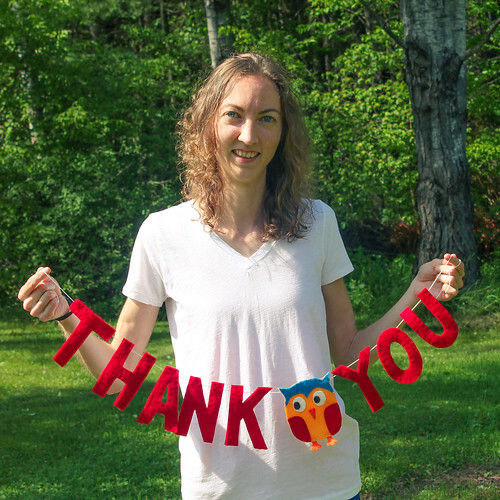 I love your banner in felt saying "thank you" with that cute little owl in such lovely cheerful colours and with wings which match the letters on your banner! So nice to see a picture of you as well! 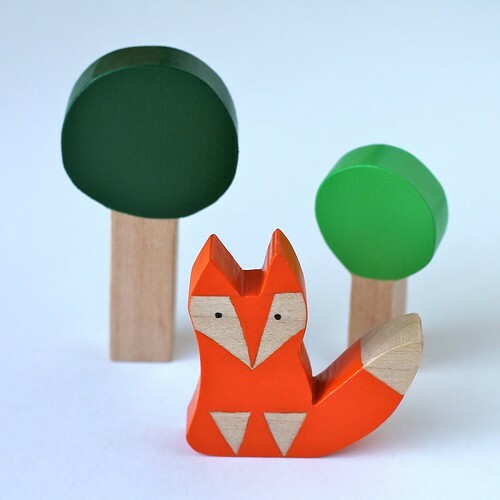 What a generous idea to make some of your lovely wooden sculptures: fox and trees and Swedish style horse, to offer as a giveaway to your randomly chosen readers! How about "Hootie" for your owl's name? It's not original, but we know what sort of winged creature we're talking about with a name like that! Also, with that look in his eyes, he looks like a "Hootie"! Your little owl looks like a 'Nerval' to me - if that's even a name - I don't know. Or how about 'Ollie' - that's kind of cute. Happy Blogiversary Kate. Love the swag, especially the owl. You're not the only one who missed their first Blogiversary. Yes, time flies way too fast. Hope you're having a great week so far! Thanks!! Ollie is very owly!! Man, so many great suggestions!! Congrats on 2 years Kate. What a great giveaway. I would love to win one of your critters. I think he looks like a Marvin or an Oscar. I love the little horse, so cute. Congrats on the anniversary. I'd name the owl Beauregard. Touche Peggy!!! I may just have to save that one for when I make something from one of his own drawings!! Happy blogiversary,giveaway is lovely,so cute.Thank you for the chance to win it.I love owl too,thanks for pattern,I think perfect name for her is Mia. Sorry I haven't visited for a while. We've been on holiday (in England). Congratulations on your anniversary Kate! 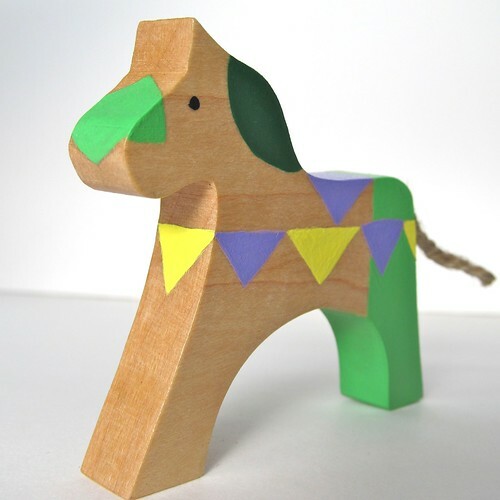 I didn't know you make little wooden art...very cute! Love the felt tutorial too, and when I looked at the owl on your banner, the first thing that came to my mind was "Scooter." Hope your having a great week! Congratulations on your blogiversary!I love love the wooden fox (fingers crossed! 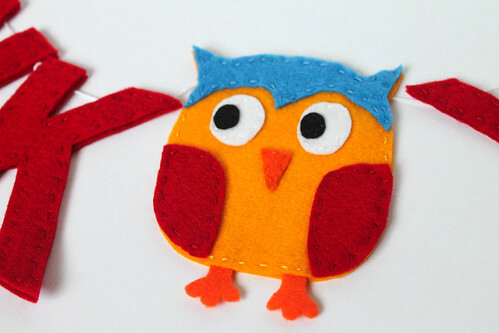 haha) and your felt owl is so cute, have you thought about making him into a brooch? Thanks Amy!! I think he would make a cute brooch... I'll have to remember that idea, thanks! Archie is cute too!! Kate, congratulations on your anniversary...I can hardly believe it's been two years! Your blog is so inspiring and a happy place to visit, thank you for that. Sorry I've been absent for a while but thank you for still visiting me, I so appreciate it. This is an excellent little giveaway you have here, I remember both these pieces and they are adorable. Now, I have to name your owl? Orlando Owl has a certain ring to it, no? Oh, it is fun to see your picture, just lovely! !